DUBAI, U.A.E., 15th January 2014: Emirates Group Security has received an award by the Australian Department of Immigration and Border Protection in recognition of the Group’s cooperation and assistance in border enforcement. . The award was presented to His Highness Sheikh Ahmed Bin Saeed Al Maktoum, Chairman and Chief Executive of Emirates Airline and Group, by Major General Jim Molan, the Special Envoy for Operation Sovereign Borders, to acknowledge Emirates Group Security’s efforts to safeguard Australian borders. “It is an honour to receive this recognition from the Australian Government. Our security team at Dubai airport is at the front line of border control initiatives, and the long history of cooperation between Emirates and Australia allow us to take an integrated approach which is not only effective and efficient, but ultimately results in a better passenger experience,” said Dr Abdulla Al Hashimi, Divisional Senior Vice-President, Emirates Group Security. “We look forward to continue working with the Australian Government to address the evolving challenges in security which will benefit both countries not just from an airline point of view, but also the tourism and trade sectors,” he added. “Emirates has constantly set benchmarks in aviation security for airlines across the world and this is what has made them leaders in the industry. We are proud to recognize the many years of outstanding cooperation between the UAE and Australia since Emirates launched its first service to Melbourne in 1996,” said Major General Jim Molan. Emirates’ hub at Dubai International Airport processes millions of transit passengers annually from various ports across the world – Africa, Europe and Asia for onward travel including Australia. Emirates Group Security ensures that all passengers travelling through Dubai International Airport to Australia are properly documented, making Group Security staff at the airport the first line of defense in border protection. The high standard of thorough checks and monitoring make an important contribution to the control of illegal migration to Australia and to the safety and security of air transport. Dr Abdulla Al Hashimi and the Group Security team were also personally recognized by Major General Molan for their commitment and dedication towards enhancing and strengthening the ties between the Group and Australia, contributing significantly to aviation security. This recognition by the Australian government is not the first for Group Security in the realm of border enforcement. In the past Group Security has been acknowledged by the UK and Canadian Governments for their services to border security. 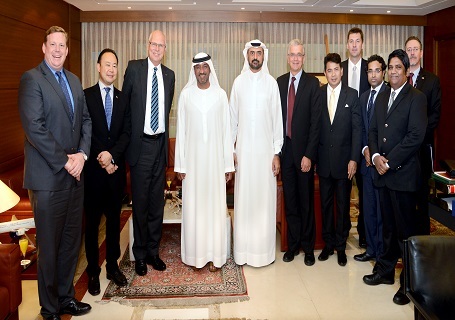 HH Sheikh Ahmed Bin Saeed Al Maktoum with Major General Jim Molan, HE Pablo Kang, Australian Ambassador to the UAE, Dr Abdulla Al Hashimi, Zack Zainal, Divisional Vice President Emirates Group Security and John Moorhouse, Regional Director Middle East & Africa - Australian immigration. The Australian Government has recognised both the Emirates Group for efforts to combat illegal immigration, and Dr Abdulla Al Hashimi, DSVP Group Security, for his personal commitment to border security.